We booked 7 nights through www.hrs.de, a very reliable reservation site on the net. Staying at the Sunotel Aston Hotel, was the exception to prove the rule. You are bound to get a bad hotel experience once in a while. The Sunotel Aston Hotel did not meet our expectation - so do not try it. The hotel is located in Eixample by the Hospital Clinic station on the blue line on the Barcelona subway. The area had a few restaurants and bars but did not offer the tourist the charm of many of the other neighbourhoods in Barcelona. There were much traffic from one of the boulevards, but the worst was the location close to a hospital. There were ambulances driving into an emergency room close by around the clock disturbing our sleep. So this is definitely not the location to look for. We could have been more shielded by the hotels sound proof windows, but we were not, as I will explain later. The staff spoke in the reception spoke English. They and the cleaning staff gave us reasonably good service. The latter cleaned our room, but we had to wait for three days to get a fresh supply of towels, and there were no instructions on how to get new and clean towels. The room itself had a decent size, two separate beds were great, but the mattresses were a little hard for our taste. It was decorated in a light yellow colour with red details, two large windows and a desk with working space facing the windows. Wonderful with dark wooden laminate floors. The storage area for clothes and suitcases was a little small, but worked for us, as we had brought one small and large suitcase. But for travellers with more luggage than that, would have had problems to find space for their luggage. 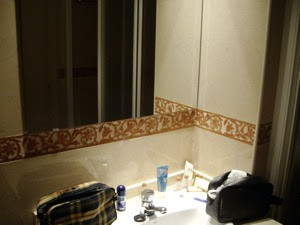 The bathroom had a large sink easy for two to store their toiletries, a bathtub with a plastic doors made it easy to have a shower or a bath without spilling to much water on the floor. And a bidet - who use a bidet any more? I don't know of any? A very strange and rather impractical thing was that even the bathroom had laminate wood flooring. This is a highly unconventional material to use in a bathroom, and the dampness had started to create smal, grey areas along the edge close to the walls. A seriously bad thing with an increasing number of hotels in Europe is the fact that they do not include a decent breakfast. This was the fact with Sunotel Aston. And the breakfast was expensive (€17), meaning that we instead used the nearby cafe and got breakfast for two at €14,50. So as we did not tried the breakfast buffet we give the hotel a meager 1B and I would like to have seen it included in the price. A breakfast is not that expensive, and the guests, including us, would have ended up much happier. 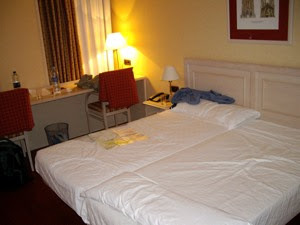 The hotel offers the following facilities on their website: "rooms fully equipped with free safety box, mini-bar, satellite TV, air conditioning, wireless connection and full bathroom with hairdryer"
We were given room 609 and found that we could not operate the air conditioning. We went down and were given the key to room 209, but the AC was out of order here as well, and as we visited the third room - number 509, we finally heard the reassuring sound of an AC. But the air conditioning offered at Sunotel Aston is not a system you may operate yourself. It is operated from the reception and be warned, it was turned off during those very warm and humid Spanish nights. Thus, every night at 2AM, we had to open the windows and listen to the traffic noise and ambulances driving by. It was intolerable for us guests to have a cool room during days, when we were not there, and a damp and hot room during night when we tried to sleep. This is dead cheap attitude from the hotel management that made the stay less enjoyful. One good thing - we loved the safe, easy to operate and free. The hotel did not offer any English TV channels and all the series was dubbed to Spanish. The mini bar was well stocked but dead expensive. The hotel also offer "solarium, outdoor swimming pool and Jacuzzi with panoramic views of the city are some other facilities also available to the visitor." Well the view was panoramic all right, and at first glance the pool looked tempting. We did, however, rather quickly discover that it was badly maintained and cleaned. As we jumped in, grey dirt started to float around in the water. A word of warning - badly cleaned pools may be a source of health problems for vulnerable groups as kids or the elderly. And the jacuzzi, empty and out of order, and we were not tempted to try the sauna either. We did use the pool to cool down, but were cautious not to swallow any of the water, and we used the shower afterwards. We did, however, LOVE the roof top terrace and used it to work on a tan and enjoy the mild sea breeze on the 7th floor. At €95 with no breakfast included, staying at the Sunotel Aston hotel gave no bargain for money. Too much destroyed the impression of this hotel. 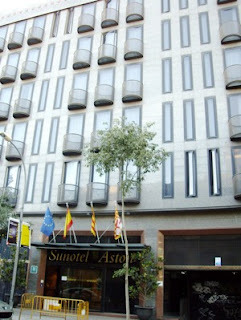 Enjoy Food and Travel does not regard the Sunotel Aston as a recommendable place to stay in Barcelona.